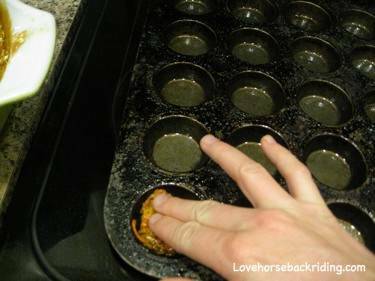 Making Horse Cookies, Time for The Oven! 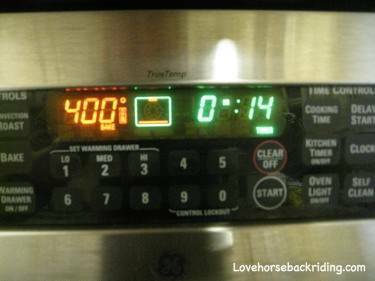 Baking homemade horse cookies shows your favorite equine partner how much you love and appreciate him. In this series you should be on step 5. 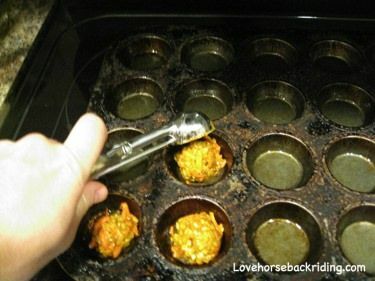 You are now ready to drop the batter into a mini muffin pan or onto a cookie sheet. If you just landed here you'll want to go back by clicking the link above so you can get up to speed quickly. If you want, you can also go to this page and scroll down to print out the recipe for these yummy cookies. 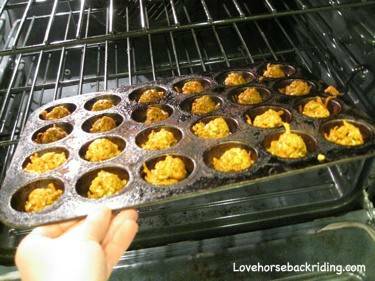 Time to get some corn oil on a paper towel or a basting brush and coat the wells in the mini muffin pan. You can use a cookie sheet, but your cookies won't be perfectly formed like store bought ones. Luckily, your horse doesn't care much what they look like! This is where your small melon baller or spoon comes in. Lightly oil it so the batter doesn't stick. 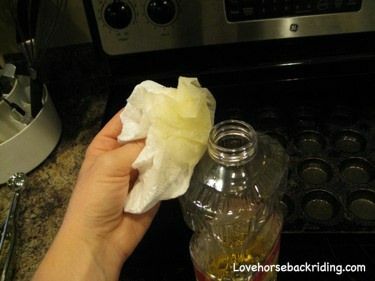 After you've dropped all the dough, take your lightly greased fingers and flatten them like shown below. When you flatten the dough it will bake into more of a disc shape. You don't have to do this if you don't mind the horse cookies being more rounded. Now into the oven they go! Be careful when you are working near the oven, it's really hot. As always, you can go back and review the last step if you want to. Or if you're ready, move on. You're almost done. Next you will cool and learn how to store them.